WELCOME TO NEW ZEALAND'S ONLY TURTLE SPECIALIST. HATCHLING TURTLES, TURTLE FOODS, LIGHTING, HEATING, AND ACCESSORIES. Not only does Hot House Turtles have New Zealands largest Turtle Breeding Facility producing a number of species of Turtles, but we ensure that your Pet Turtle has a complete and balanced diet, correct Calcium & Vitamins, quality feeding products, excellent reference books, plus all the essential accessories to thrive, not just survive. 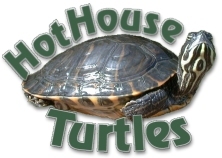 Look for all Hot House Turtles products in your favourite Pet Shop. Hot House Turtles also distributes a large variety of high quality Diets, Calcium & Vitamins, Heating and Lighting, Accessories, and Reference Books, especially for Australian Bearded Dragons & Australian Water Dragons! Hot House Turtles sends it's products from Kaitaia in the far north, to Invercargill in the deep south. Try our products today. We know your Reptile will love you for it. NEW FLUKER'S DIETS AVAILABLE NOW IN PET STORES NEAR YOU!!! Click here to find your nearest Pet Shop.